Trees, soil, and rocks form a miniature living landscape. Saikei (栽景) literally translates as "planted landscape". :228 Saikei is a descendant of the Japanese arts of bonsai, bonseki, and bonkei, and is related less directly to similar miniature-landscape arts like the Chinese penjing and the Vietnamese hòn non bộ. It is the art of creating tray landscapes that combine miniature living trees with soil, rocks, water, and related vegetation (like ground cover) in a single tray or similar container. A saikei landscape will remind the viewer of a natural location through its overall topography, choice of ground materials, and the species used in its plantings. A typical saikei is contained in a large ceramic tray with low sides. Within the tray, rocks and soil are arranged to suggest a natural landscape, often modeled on a specific type of real landscape like a seaside or a mountain path. Small living trees are planted in the soil and may be arranged to emphasize perspective, for example, with smaller trees to the rear of the display. The trees themselves are similar to, but less elaborately shaped than, bonsai trees. They are selected and cultivated to look like mature trees that match the simulated landscape they grow in. Non-tree plant specimens may also grow in the saikei, such as ground cover or other small plants that help evoke the landscape. Saikei differs from the related Japanese art forms in some key ways. According to Lew Buller, Toshio Kawamoto (the founder of the saikei form) "was adamant that his living landscapes were not bonsai", citing saikei rules such as the mandatory use of stones, and the placement of trees and roots above the rim of the tray. Bonsai uses stones as the base for a tree or trees in the root-over-rock style (Sekijoju) and growing-in-a-rock (Ishizuke) styles, but does not form landscapes from mixed stones and soil. The shape of the ground is very important in saikei, where it is of reduced or non-existent importance in bonsai. In general, saikei concentrates on the evocation of a natural living landscape, rather than on the character of individual trees as emphasized in bonsai. The arts of bonseki and bonkei also depict miniature landscapes in trays, but do not incorporate living trees or other flora. In bonseki, simple landscapes are portrayed on flat trays using sand and stones. In bonkei, rocks and sculptable materials (e.g., cement) are formed into hills and mountains rising out of ground materials like sand and gravel. Miniature figures of people, animals, buildings, and other outdoor elements may be placed on a bonkei but would be out of place on a saikei. The presence of living materials means saikei are challenging to preserve and display relative to bonkei. The school of saikei was founded in Japan by Toshio Kawamoto after World War II. Kawamoto was born in 1917, the eldest child of the bonsai master Tokichi Kawamoto, and was trained in the art of bonsai. In 1960, following his father's death, he ran the family bonsai nursery Meiju-En. He actively promoted the practice of saikei after this time, publishing two seminal books on saikei (Bonsai-Saikei and Saikei: Living Landscapes in Miniature) and participating in the creation of the Nippon Bonsai-Saikei Institute and the Nippon Saikei Association. At the time Kawamoto began developing the rules and form of saikei, the practice of bonsai was at a critical low point in Japan. The labor-intensive cultivation of bonsai had been near impossible under wartime conditions. Many bonsai, in development or completed, had died in the nation's major collections, as well as in the gardens of individuals across the country. Post-war economic conditions made the purchase and cultivation of a real bonsai almost impossible for average Japanese households. Kawamoto created a simple form of tree display providing many of the aesthetic and contemplative qualities of bonsai, while also supporting the cultivation of plant stock that could eventually be used as bonsai material. He based this art form mainly on the principles of group plantings from bonsai and rock displays from bonkei and bonseki. His original objective was to age and thicken up the trunks of young nursery stock. Saikei was a way for inexpensive plants and stones to be brought together in a pleasing arrangement, easily accessible to the average person. :228 As a saikei specimen aged, it would produce candidate bonsai trees, which could be removed from the saikei for cultivation as bonsai. As a relatively young art form, Japanese saikei does not have deep traditions of its own. But it is related to a number of older confined-landscape forms popular in Asia, including Japan's bonkei, the Chinese art of penjing, and the Vietnamese art of hòn non bộ. The term penjing applies both to individual trees growing in containers, similar to bonsai, and also to detailed miniature landscapes which include trees, other plants, rocks, soil, water, and miniature figurines of people, animals, and other items. Similarly, hòn non bộ emphasizes the creation of stylized miniature islands projecting from a body of water and carrying a burden of trees and other plants. Saikei was designed to be an easier practice to participate in than bonsai. A saikei container provides liberal quantities of soil, easing the burden of careful watering and root pruning that mark bonsai cultivation. Saikei plantings are quick to assemble, with first-time participants able to create an effective result in a few hours. The trees can be very young and therefore inexpensive, and none of the other materials except the tray itself cost much. The trees themselves do not require a great deal of shaping or other manipulation, compared to bonsai's complex and time-consuming development practices. 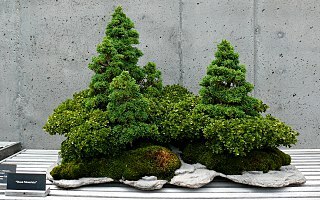 As a result, saikei is a good fit for beginners and for those who wish to spend little on the hobby of growing dwarfed trees. A saikei display does contain numerous living plants, however, and requires growing conditions that allow them to thrive. The saikei will be designed to use plants that all share similar cultivation requirements, particularly soil type and watering. The general climate requirements of the plants will also be similar: it is difficult to cultivate plants from different hardiness zones in a single saikei display. Saikei containing plants that require outdoor conditions will be grown and displayed out of doors, possibly with special protection in winter months. As a particular saikei ages, some of its trees may grow out of proportion to the rest of the display. This change is expected and in fact is one of the goals of saikei. The owner has two choices, to reduce the size of the large trees, or to remove them from the saikei and grow them separately. 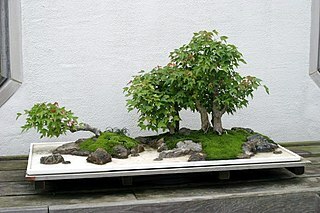 Reducing their size involves bonsai-related techniques such as pruning. Removing oversize trees from the saikei leads naturally to potting them individually and cultivating them as bonsai. After removal of these trees, the saikei can be augmented with new trees, restyled to suit the remaining trees, or dismantled and redesigned to a new plan. In all cases, the trees are retained and continue to be cultivated under the saikei principle of developing potential new bonsai. Typical bonsai multiple planting, with simple topography and single vegetation mass. The art of saikei overlaps bonsai to some extent, as bonsai includes a tradition of multiple-tree plantings. Saikei has a much stronger emphasis on the shape and structure of the landscape than does bonsai, and has much greater freedom in the layout and materials of that landscape. Trees can appear singly or in groups at any suitable spot in the landscape, even on the sides and tops of rocks representing mountains or hills. There is no rule to mass the trees together in a contiguous unit in a saikei. Bonsai multiple-tree styles, on the other hand, have very simple landscapes, usually a simple plateau or slight dome of soil beneath the trees. The bonsai plantings are generally developed to display a unified silhouette involving all the trees, in which they produce a single foliage mass behind and to the left and right of the trunks. :208–218 In bonsai, trees completely dominate the group planting, while in saikei, trees simply decorate the saikei landscape. A saikei must contain rocks, which may play the role of mountains, cliff faces, stone outcroppings, stream beds, shorelines, or other aspects of the landscape. :229 They are the skeleton of the landscape, and appear prominently. In bonsai group plantings, rocks are rare and if present are inconspicuous and subjugated to the trees. Saikei does not focus on the detailed form of each tree, which is a prime objective for bonsai. The trees in saikei are not expected to be the mature, thick-trunked specimens that are common in bonsai. For the trees to be in scale with even a large saikei display, they cannot be much more than four to six inches in height. Smaller saikei displays may require even smaller trees. As a result, the saikei trees are often immature and thin-trunked, with small root structures and simple branching. Moreover, the use of small trees means that small-foliaged species are preferred. Example varieties include small-foliaged juniper, Hinoki cypress, azalea, and Chinese elm. :229 The aesthetic impact of the saikei display results not from striking individual tree specimens, but from the builder's general landscape design, the cumulative visual impact of several or many live trees, the rocks and soil of the landscape, and the variety of other plant forms placed in the display. Saikei allows multiple species of tree to be placed in a single landscape, and allows other plant forms like flowers and grasses, while multiple plantings in bonsai are typically a single species of tree with moss alone allowed as additional vegetation. Because of this flexibility in plant materials, saikei can be designed to show the progress of the seasons in much greater variety and detail than can a mono-culture bonsai planting. Aesthetically pleasant reference to the seasons is an important tradition in Japanese gardens, and a saikei display can be much more garden-like than a bonsai display. Deciduous and flowering trees, which change through the growing season, can be mixed with conifers that will remain green all winter. Spring leaves and flowers, summer fruit, autumn coloration and leaf-fall, and the contrast of bare-branched deciduous trees with snow-covered evergreens can represent the annual cycle of an entire garden in the space of a tea-table. Saikei works with a palette consisting only of plants, rock, soil, and occasionally water. Bonkei, penjing, and hòn non bộ allow the inclusion of miniatures in the scene. These miniatures can include wooden structures like huts, bridges, or boats. Ceramic figurines of people and animals are also common, and all miniatures contribute to the sense of scale in an individual container. Saikei landscapes are simpler and more abstract, emphasizing the landscape's natural shapes and materials and leaving viewers to engage their imaginations. 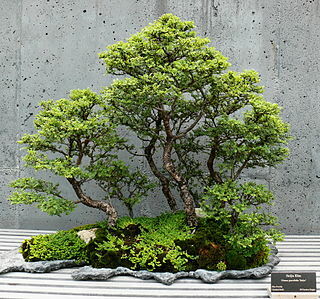 In this, saikei is similar to bonsai, which also avoids decoration apart from moss and rock in the container. Saikei displays can span a range extending from the austerity of a classic bonsai to the richness of a Japanese garden in miniature. At this point in the development of the art form, there are no restrictions on the number of plant varieties in a display or the complexity of the landscape. The saikei designer can suggest wabi or sabi with a simple planting among aged and weathered rocks, or evoke an entire mountain forest with multiple peaks, trees, seasonal flowers and grasses, ground cover, and moss. Some saikei even span two or more containers, which when placed near each other create an expansive and complex image. Writers on saikei, particularly the founder Toshio Kawamoto and Herb Gustafson, who studied at Kawamoto's Bonsai Saikei Institute, emphasize that the design and execution of a saikei should portray a realistic natural landscape. Austerity and simplicity are not the important principles in saikei that they are in bonsai. A saikei developed in Kawamoto's style will be complex in topography, rich with vegetation, and strongly evocative of a realistic location in nature. Trees will have natural shapes, without contortion. Trees and ground cover will have relative sizes that almost constitute a model of a landscape, free from exaggerated proportions. Plants will be selected to match the simulated location, so that a single planting will contain only species likely to be found together. If bonsai imply the aesthetic principles of the abstract and austere Japanese Zen garden, saikei resemble traditional Japanese tsukiyama gardens like Suizen-ji Jōju-en, which are modeled after famous real landscapes. With a briefer tradition and simpler aesthetic rules than bonsai, saikei is more accessible to the amateur. According to Kawamoto, "[s]aikei has no bounds; it avoids the rigid formality that is often evident in bonsai, lending itself more to experimentation and freedom in composition. ":7 Simple aesthetics mean a saikei display is easier to create and to appreciate than one of its parent forms. The viewer's pleasure arises from the ingenuity of the designer in creating a miniature of nature, a natural aesthetic response that requires no schooling and can be enjoyed by almost any observer. ^ "Origins of saikei". Phoenix Bonsai. Retrieved 2010-10-26. ^ a b c d e Koreshoff, Deborah R. (1984). Bonsai: Its Art, Science, History and Philosophy. Timber Press, Inc. ISBN 0-88192-389-3. ^ a b Gustafson, Herb L. (1994). Miniature Living Bonsai Landscapes: The Art of Saikei. Sterling Publishing Co., Inc., New York. ISBN 0-8069-0734-7. ^ Buller, Lew (2005). Saikei and Art. Lew Buller. p. 18. ISBN 0-9772443-0-X. ^ a b c Kawamoto, Toshio (1967). Saikei: Living Landscapes in Miniature. Kodansha International, Tokyo, Japan. ISBN 978-0-87011-048-1. ^ "February - Bonsai Book of Days". Phoenix Bonsai. Archived from the original on 2010-12-11. Retrieved 2010-10-26. ^ "Imperial Bonsai Collection". Phoenix Bonsai. Archived from the original on 2011-11-01. Retrieved 2011-09-29. ^ Phan Van Lit, Lew Buller (2005). Mountains in the Sea: The Vietnamese Miniature Landscape Art of Hon Non Bo. Timber Press, Incorporated. ISBN 0-88192-515-2. ^ Handbook on Bonsai: Special Techniques. Brooklyn Botanic Garden: Brooklyn, New York. 1966. pp. 24–31. ^ Adams, Peter (1999). Bonsai Landscapes. Ward Lock, London. ISBN 0-7063-7767-2. This page was last edited on 1 May 2018, at 20:01 (UTC).